SEE MORE: Learn More about Our Company Here! 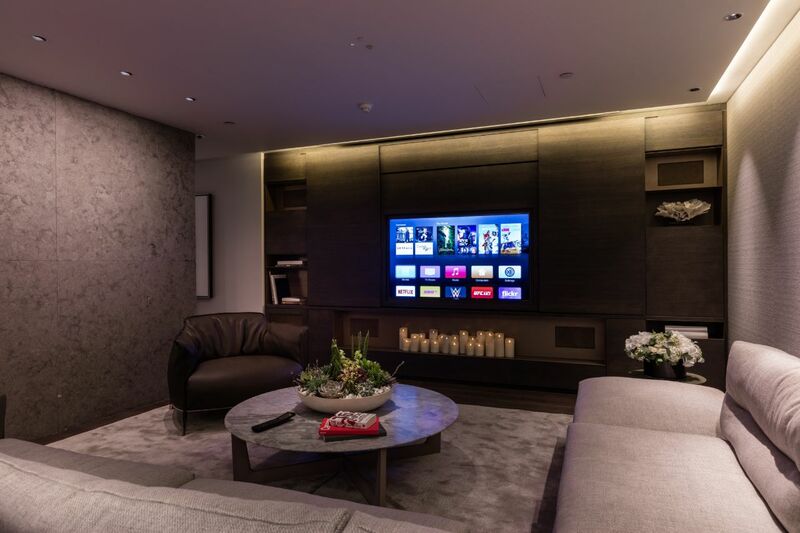 Crestron has some of the most robust home theater setups in the AV industry. Its programming is sophisticated enough to allow you to watch a few different basketball games all at once; enjoy a TV show while someone else plays a video game; and much more. Its effortless integration with your home automation also lets you set a scene for maximum entertainment. You can press one button or use voice command, and your Crestron home automation will power down lights, lower motorized window treatments and finish priming the atmosphere for a relaxing night. Furthermore, you can adjust the lights, shades and temperature throughout the whole house -- without leaving your media room. Though we like to take note of industry trends, we can’t follow them blindly when creating a customized home theater. We prefer to meet with you, listen to your needs and preferences and proceed from there. Then we bring that vision to life through our design and installation services, but we don’t stop supporting you then. Bob’s TV provides ongoing help long after the install to make sure that you are still happy with your system and that everything runs efficiently for years to come. Cutting-edge technology and intuitive controls provide a solid foundation for your media room, but comfort plays a role in creating enjoyable spaces too. We work with luxury furnishing companies like Cineak, Bass Industries, Salamander, and Palliser to furnish your media room in designer style. These companies provide ergonomic seating options that surpass the puffy furniture most people associate with comfort. These versatile sofa and chair models will also look equally attractive in other spaces throughout your home, such as living rooms, so just let us know if you want to incorporate these designs in other spaces. As with everything we do, Bob’s TV offers you complete turnkey solutions for every situation. If you’re ready to get started with a hassle-free consultation, call Bob’s TV today at 352-245-2183, or contact us through our website. We can’t wait to talk to you about your theater and media room needs and how we can serve you!